If your child has a broken leg, he may be on strict bed rest or he may be able to get around, but slowly, on crutches. Whatever the doctor’s orders are, a child with a broken leg is limited. However, it isn’t hard to find activities for him -- it just requires a little thought, creativity and preparation. Plan an in-home movie festival. Allow your child on injured reserve to pick all the movies. Invite all of her friends or gather your whole family, pop some popcorn, dim the lights and screen as many movies as your injured child wants. If your youngster is limited to her bedroom, move the television and DVD player in there. A similar screening event idea is to rent or buy the entire series of your child's favorite TV show. Spending an entire day, or more, watching every episode of a loved television series is sure to take her mind off of her broken leg. Load up on puzzles and have a party. If your child is young, find colorful puzzles with big pieces. If your child is a little older, buy a puzzle with a hundred or a thousand pieces. This challenge will keep him occupied until he gets the cast removed. Alternatively, take a picture of your child or one of his favorite things or places and have it made into a puzzle. He’ll be so excited when he puts the puzzle together to find a favorite place or treat or even a picture of himself. Stock the arts and crafts box. Buy your child’s favorite paints, stamps or markers and let her get creative. Hang her finished projects on a clothesline in her room. Everybody will be amazed to see how many masterpieces she can create in the time she’s down and out. This is also a good time to try a new artistic hobby. If your little one has never made a scrapbook or attempted needlepoint, now is a good time to learn that new craft. Invite your child’s friends for cast decorating play dates! You’ll need permanent markers and anything with an adhesive backing, such as stickers, stick-on sequins, pom-poms and sticky felt decorations. Your child can pick any theme that he wants his artisan friends to follow, or everyone can choose their own picture or design. The patient and his friends can also play tic-tac-toe or hangman on his cast. When the cast comes off, your child will have a fun souvenir of this chapter in his life. It’s important to remember that a cast cannot get wet. 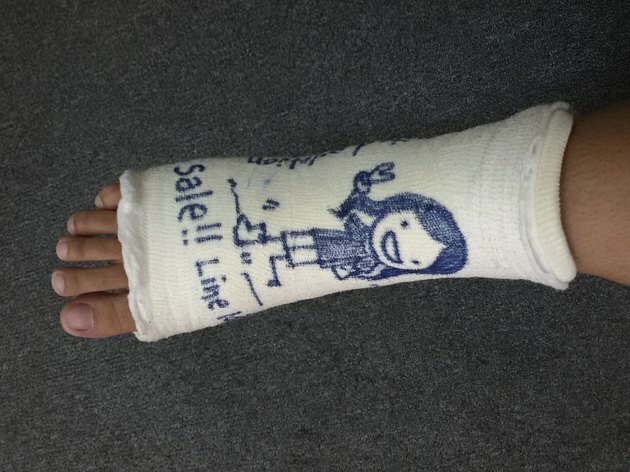 Don’t let the children wash their designs or use water-based paint, and remind them to be gentle around the broken leg.